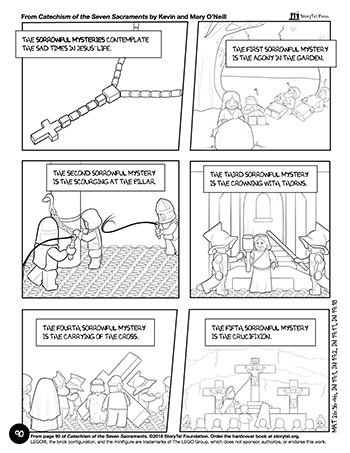 [Free Printable]: Coloring Page for the Sorrowful Mysteries of the Rosary! Keep your child’s hands busy while their minds are focused on Christ’s Passion! From the rosary section of Catechism of the Seven Sacraments, this coloring page is meant to help your children reflect more deeply on the Sorrowful Mysteries of the rosary. Once it’s downloaded, you can print as many times as you need this season! 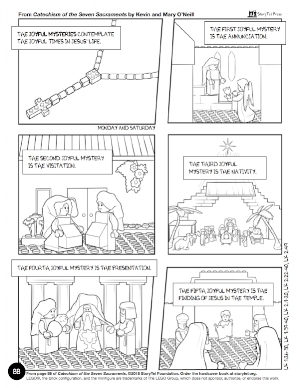 [Free Advent Printable]: Joyful Mysteries Coloring Page! Praying the Joyful Mysteries during Advent is a beautiful yet simple way to prepare for Christmas. But sometimes our kids need help focusing! 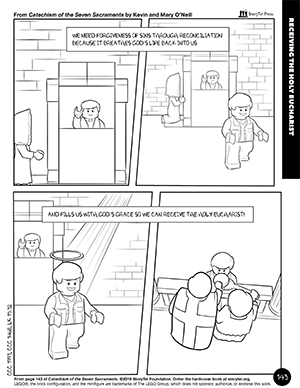 This coloring page, from the rosary section of Catechism of the Seven Sacraments, can help your children reflect more deeply on each mystery as they follow along with the rest of the family. Once it’s downloaded, you can print as many times as you need this season! During the show, visitors to our StoryTel website were be able to preview the entire Catechism of the Seven Sacraments from cover to cover! That preview will remain up through Thanksgiving weekend. StoryTel on EWTN Radio Saturday 11/17! Tomorrow, Saturday, November 17th, our Catechism of the Seven Sacraments authors Kevin & Mary O’Neill and StoryTel Publisher Don Carney will be the featured guests on EWTN’s most listened to weekend radio show, The Good Fight with Barbara McGuigan from 2-4pm ET. Listen here. Barbara and Don will first talk about the mission and work of StoryTel Foundation focusing on two StoryTel films that will be airing on EWTN’s Global Catholic Television Network coming up in December: Where Heaven Meets Earth and On Assignment Magazine: Holiday Edition. Then we’ll spend the rest of the two hour program talking with authors Kevin and Mary O’Neill about their new hit book Catechism of the Seven Sacraments, published by our own StoryTel Press. While The Good Fight is being broadcast tomorrow and for the rest of this weekend all visitors to our StoryTel website will be able to preview the entire Catechism of the Seven Sacraments from cover to cover! Our conversation with Barbara McGuigan will explain how and why this great new Catechism for the whole family came about while together we explore the teachings and imagery in the book with listeners able to see the book on their computers at home at the same time! So please join us tomorrow from 2 pm to 4 pm ET on EWTN’s The Good Fight with Barbara McGuigan! We’re delighted to release our first Christmas themed book trailer for our new book, Catechism of the Seven Sacraments. In this video we go behind the scenes and share insights about the book from the authors, taken from our upcoming documentary film about the making about the book. Enjoy. QUICK BOOK UPDATE: Over 10,000 copies of the book sold in its first six months! We look forward to a robust Christmas season. More about the book here. In honor of the month of the Rosary and on the 101st anniversary of the Miracle of the Sun at Fatima, we’re delighted to release our next short video about our new book, Catechism of the Seven Sacraments. This short “spotlight” video is all about the section of the book that teaches kids how to say the Holy Rosary. Have you ever wondered what 10,000 hard cover textbook-sized book looks like? We’re excited to receive our second printing of 10,000 copies of Catechism of the Seven Sacraments at our fulfillment center here in Omaha. Just in time too, as we only had a handful left. Now we’re all set for the Christmas shopping season! Order your your copy today before we burn through these in the Christmas shopping season! This is our second printing, as we’ve sold nearly 10,000 books since our launch in April. Learn more about the book. Catechism of the Seven Sacraments eBook now available! StoryTel Press is excited to announce that the Kindle eBook version of our new book, Catechism of the Seven Sacraments, is now available at Amazon! Kindle books can be read on all Amazon Kindle tablets and readers and on the kindle app on all smartphones, tablets, and computers. Our ebook displays particularly well projected from a computer for classroom use. If you’re new to eBooks, please check out our info video below. 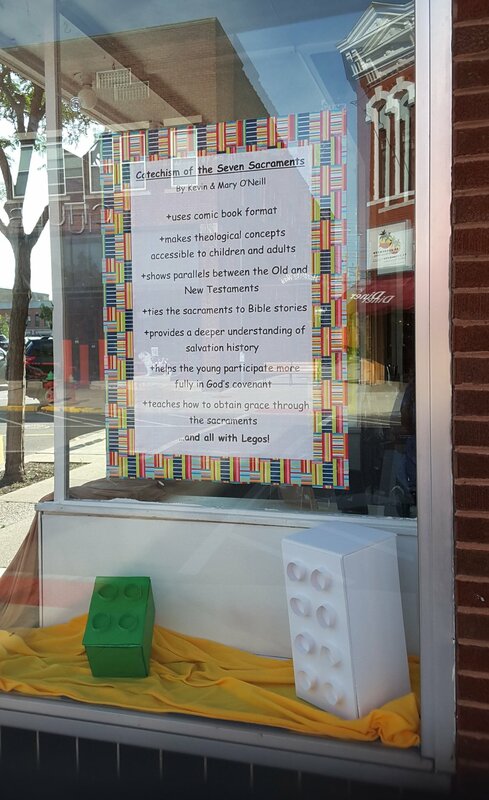 Thanks so much to Assumption Books in Macomb, IL for promoting our book, so creatively in their display window!